In this surprising, noirish page-turner, B. 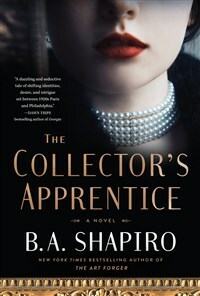 A. Shapiro once again takes readers into the world of art, glamour, and mystery. Accused of helping her fiancé steal her family’s fortune and her father’s art collection, Paulien Mertens has fled to France. To protect herself from the law and the wrath of those who lost everything, she has created a new identity. Paulien, aka Vivienne, takes a position working for an American art collector modeled after real-life eccentric museum founder Albert Barnes and quickly becomes caught up in the 1920s Paris of artists and expats, including post-Impressionist painter Henri Matisse and writer Gertrude Stein. From there, she sets out to recover her father’s art collection, prove her innocence, and exact revenge on her ex-fiancé. B. A. Shapiro has made the historical art thriller her own, and once again she gives us an unforgettable tale about what we see—and what we refuse to see.